This month, I decided to stick with my style - Classic with a Twist. There was nothing classic about the colours and was all twist! And I love it! I did purchase some add-ons, but those are coming separately! 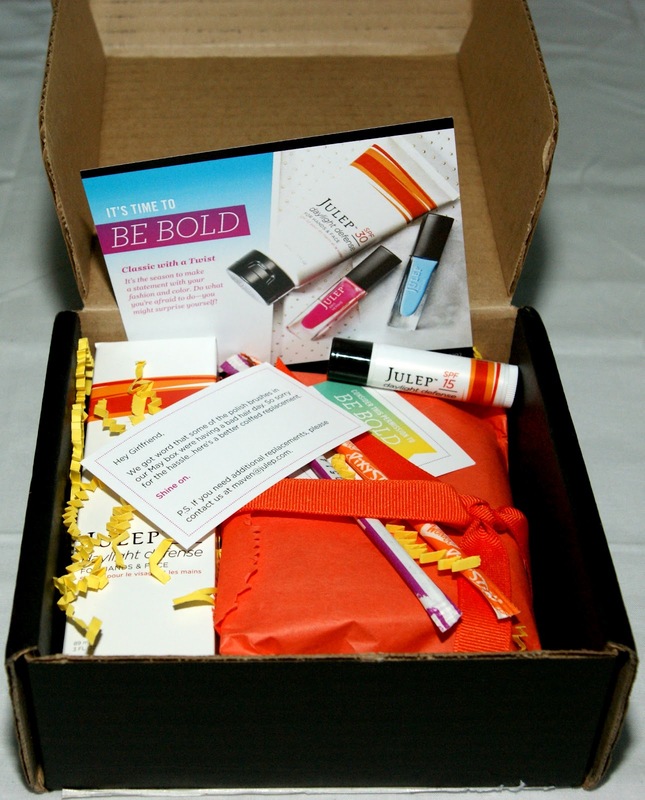 Just in the nick of time, this month's box came with Julep's daylight defense lip balm and daylight defence hand and face cream, and of course my gorgeous colours! Julep SPF 30 Daylight Defense for hands and face. I'm not sure how I feel about this product. I always thought that you should use what was meant for your hands on your face because it would be too thick? But I guess, if it was a face product, then you can use it on you hands? It contains Vitamin E, which helps hydrate skin and strengthen nails while the built-in SPF helps guard against fine lines and sun spots. This product, like all their other products does not contain any paragons or sulfates and is PABA-free. 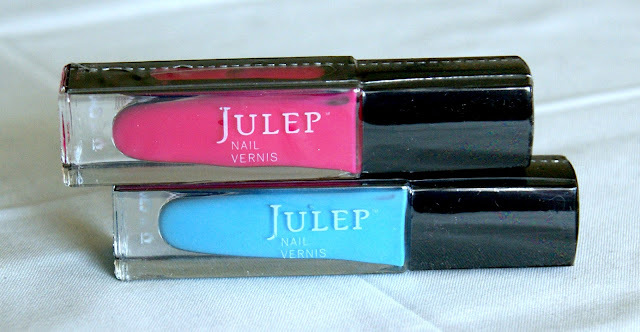 Julep SPF 15 Daylight Defense Lip Balm in Vanilla Mint. It smells fantastic! It smells like those minty chocolates that you get from restaurants. It applied really nicely but it stings a little - I think that it might be the mint. I hope that I can stop myself from trying to eat this! This month, Lauren and Claire paid me visit and said that they'd like to stay. Claire is a beautiful sky blue creme with a gloss finish. It was kind of streaky and required three to four coats. Lauren is a hot tropical pink creme with a matte finish. I really liked this. Once again, it was a little on the streaky side and took about four coats to get the opacity that you see in the swatch below. But I still love this shade! Overall, I'm pretty pleased with this month's box and this subscription service in general. I really like the fact that I can skip a month or that I can switch up boxes if there is another box that I like better! And these two shades are just perfect for those summery, lazy, breezy days! I am in love with the colors you received! Such a gorgeous duo, quick question do you know where I can get one of those nail reel thing? Beauty supply? Trade Secrets? ebay! They are so cheap! Both gorgeous colours - LOVE! Thanks for the post lady! I got thia box too and i love it :) I wasn't sure about the cream at first but i really love it now! NICE!! I received some cute colors too and have yet to try them out! Hi Jamie! Just saying hi and hope that everything's ok! 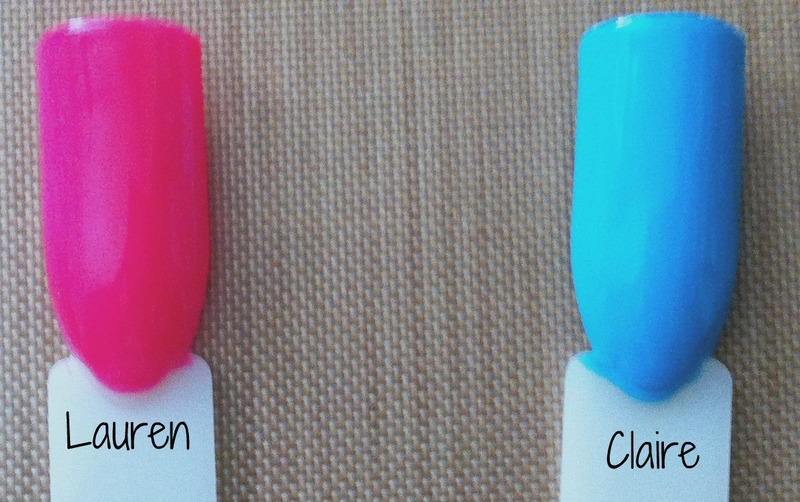 I love the Claire color! Miss your posts. Hope you are back soon!